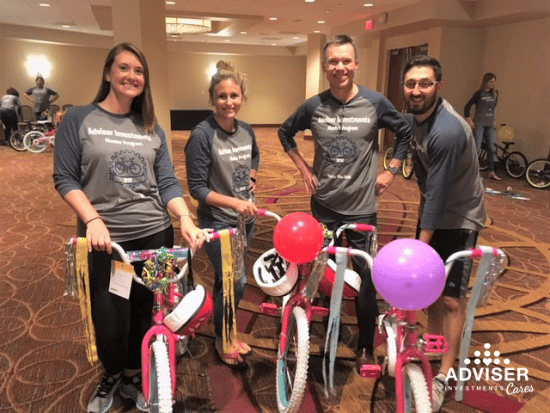 On August 6, 2018, our team members tightened bolts, greased bearings and secured tires to assemble children’s bikes. Big Brothers Big Sisters then donated all of the bikes to children they assist. Of the 3,000 youth that Big Brothers Big Sisters of Massachusetts Bay works with, 95% qualify for free or reduced lunch, 100% live in single-parent or under-resourced households and 400+ live in public housing developments. Our Mentorship Program pairs long-time employees with more recent hires to encourage career growth, inter-departmental collaboration and friendship. We work with small teams that rotate annually and focus on both internal professional goals and broad-based community service efforts. It was a privilege for this group to contribute to Big Brothers Big Sisters’ long-standing mission to empower local youth using the strength of personal connections and mentoring relationships. Learn more about Big Brothers Big Sisters of Massachusetts Bay.